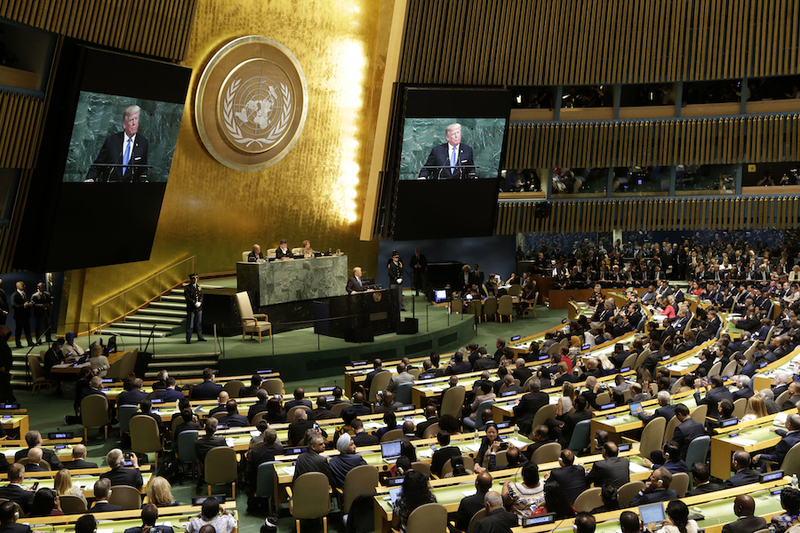 UNITED NATIONS (CN) — Audible gasps coursed through the United Nations General Assembly on Tuesday as U.S. President Donald Trump used his first address before the international peacekeeping body to threaten North Korea with annihilation. “The United States has great strength and patience, but if it is forced to defend itself or its allies, we will have no choice but to totally destroy North Korea,” Trump announced from the marble podium. Pausing as the crowd of heads of state and diplomats registered shock, Trump addressed North Korea’s leader Kim Jong Un with the nickname he recently coined for him. “Rocket Man is on a suicide mission for himself and for his regime,” the president added. Representatives of North Korea quickly exited the room as Trump delivered the remarks, taking a bellicose turn on a morning dedicated to optimism and international cooperation. The three speakers before Trump – U.N. Secretary-General Antonio Guterres, President of the General Assembly Miroslav Lajcak and Brazilian President Michel Temer – focused their speeches on taking responsibility for climate change, helping the plight of the world’s refugees and embracing multilateralism as a solution to the world’s problems. Trump meanwhile ignored the climate crisis entirely, hammering themes of national sovereignty and expressing the desire to unilaterally exit a nuclear weapons agreement. Clocking in at three times the recommended U.N. floor time, Trump opened his 10 a.m. address with perfunctory comments about the victims of hurricanes followed by his usual boasts about last year’s election outcome, stock market raises and high employment figures. Trump then promised to boost spending to a U.S. military that is already larger than 10 of its nearest competitors. “Our military will soon be the strongest it has ever been,” he said. Directly before his speech, Brazil’s Temer spoke of his country’s commitment to sign a landmark treaty to ban nuclear weapons, and implored other nations to work together toward their elimination. Trump took another tack, offering fellow member states an arch-nationalist framework. “As President of the United States, I will always put America first, just like you, as the leaders of your countries will always, and should always, put your countries first,” he continued. For Trump, the nationalist’s role in an international body was not a contradiction in terms. Nikki Haley, whom Trump installed as America’s permanent representative to the United Nations, predicted last week that Trump’s speech would consist of tough love. “I personally think he slaps the right people, he hugs the right people, and he comes out with the U.S. being very strong in the end,” she said. 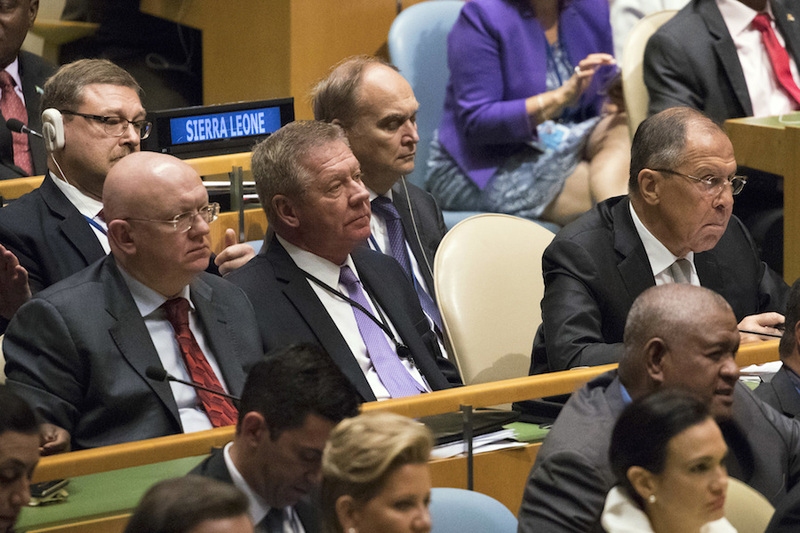 For North Korea and Iran, those slaps turned out to be full-front verbal assaults, along with other blows to Latin American nations that identify as socialist. “The problem in Venezuela is not that socialism has been poorly implemented, but that socialism has been faithfully implemented,” Trump said in remarks greeted by a mixture of laughter, applause, grumbling and groans. 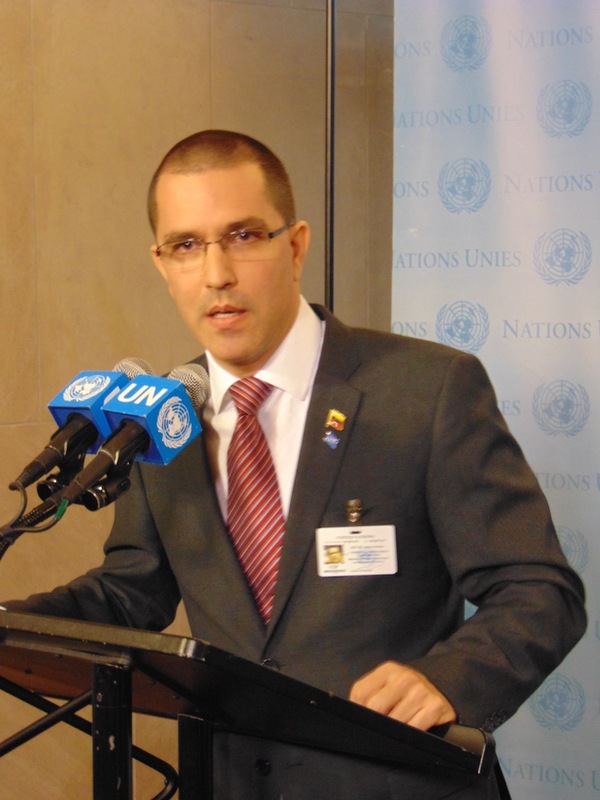 Venezuelan Minister of Foreign Affairs Jorge Arreaza described Trump’s anti-socialist rhetoric — also directed at communist Cuba — as a throwback to his predecessor Ronald Reagan’s during the Cold War, a comparison that he did not mean as a compliment. European leaders reacted to Trump’s speech with an air of tactful disagreement. When a reporter at a press conference confronted French President Emmanuel Macron about his many policy disagreements with the U.S. president, for example, Macron refused to take the bait. “First of all, these kinds of topics allow me to reserve my views and my convictions,” he said. “That’s how the bilateral relations are nurtured and maintained,” he said at a press conference. Macron did, however, urge Trump to reconsider his stated desire to pull out of the Paris agreement. 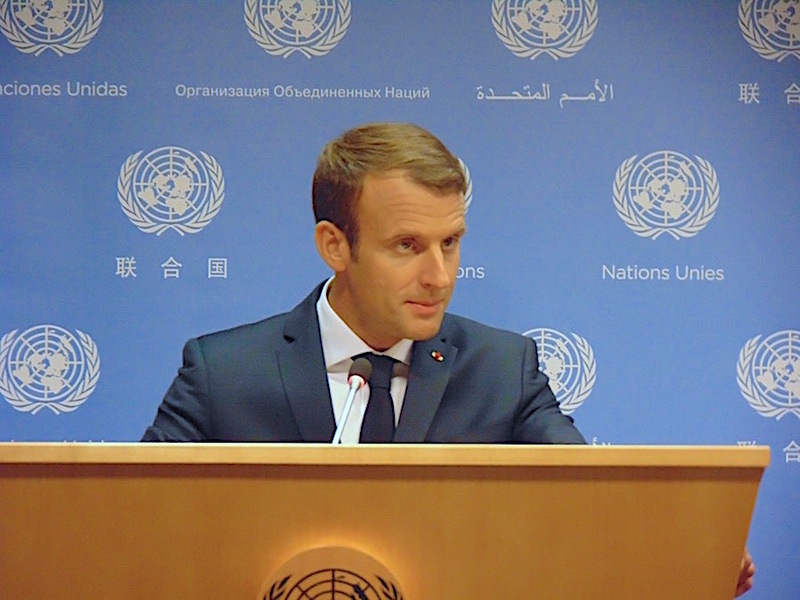 On North Korea, Macron said that he would rule out any military response whatsoever, let alone obliteration. Talking to reporters in the U.N.’s Rose Garden on Tuesday, Belgian Prime Minister Charles Michel said Europe is taking a different approach than Trump. 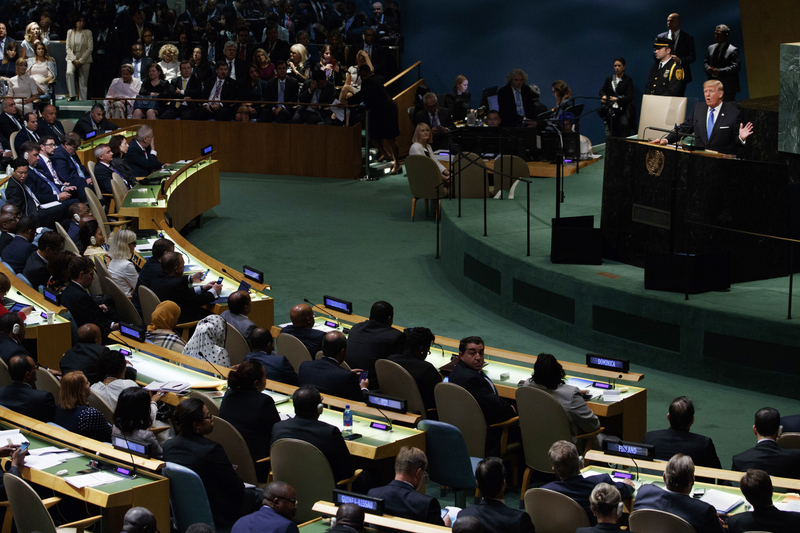 At a time when many U.N. members prepare to sign a nuclear ban treaty, references to the only U.S. president to use atomic bombs against another nation were recurrent in Trump’s 45-minute United Nations speech. 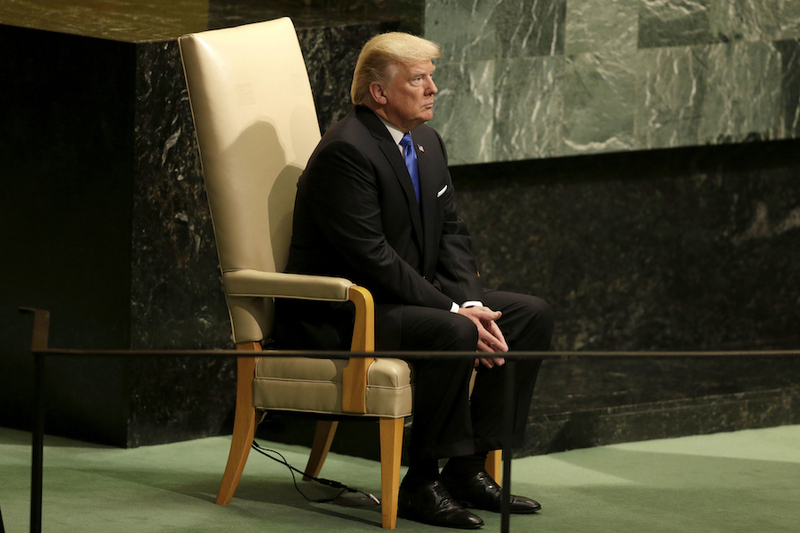 “The success of the United Nations depends upon the independent strength of its members,” Trump said, quoting President Harry S. Truman. Trump, who spent Monday discussing Iranian relations with French and Israeli leaders, has indicated his desire to reopen the Joint Comprehensive Plan of Action, better known as the Iran nuclear deal. While welcomed by Israel’s hardline Prime Minister Benjamin Netanyahu, the Trump administration’s threats to scuttle the international agreement have put France on edge. Macron saw no alternative to the Iran deal to avoid a Persian nuclear standoff. “If we throw out this agreement, there is nothing to replace it, and I don’t want to find myself in a no man’s land,” Macron said. Netanyahu, who spoke in the afternoon on Tuesday, voiced strong praise for Trump’s remarks. “In over 30 years in my experience with the U.N., I never heard a bolder or more courageous speech,” the prime minister said in a statement. “It will be removed by a mere change in the calendar,” he said, referring to the restraint on Iran’s nuclear program. As it stands, Netanyahu said, Israel would oppose the agreement. Iran’s President Hassan Rouhani will take the podium on Wednesday. While Iran denies any intention to build a nuclear weapon, North Korea justifies its effort as a deterrent to the regime change that was the fate of Iraq. George W. Bush named all three of those nations the “Axis of Evil,” a type of Biblical imagery revived by Trump on Tuesday to describe international violence. Trump took care in his speech not to make any explicit mention of Russia, only hinting at criticism by mentioning Ukraine as an example of a threat to sovereignty that the world must reject. Russia annexed Ukraine’s Crimea region in 2014 and has also backed separatists fighting in eastern Ukraine. Tom Wright, a senior fellow at the Brookings Institution, saw Trump’s remarks as more evidence of the deference his administration pays Russian President Vladimir Putin. “This is a speech that advances Russia & China’s vision of [international] order – nationalist, transactional, values-free, mercantilist, post-American,” Wright posted on Twitter. Ministers for Russia and China are slated to speak on Thursday.